While Indo-Thai food has its place, sometimes what you want is the real thing. 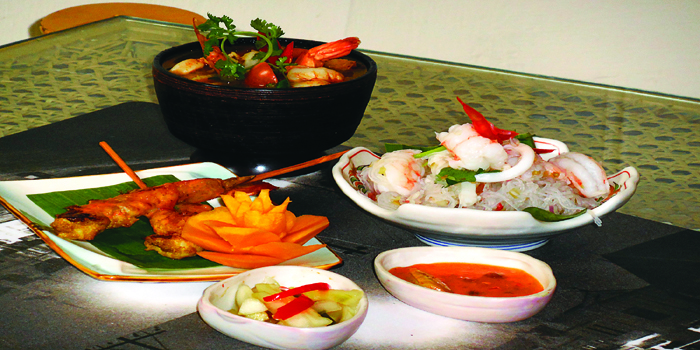 The Chancery is offering just that, with chef Daneiel Kumara��s Thai food festival. Take your pick from his vegetarian, seafood or non-veg set menus, which promise to take you a�?beyond red and green currya��. Start the meal with kung satay, skewered Thai spiced prawns served with a delicious peanut dipping sauce and pickled cucumber. Also served up with satay sauce is the skewered chicken or tofu, both delicately flavoured with lemon grass. The soup follows a�� a vegetable, chicken or prawn broth. All have the quintessential Thai lemongrass and kafir lime flavour, but we felt that the seafood broth, tom yam talay, with its rich infusion of prawns, squid and shrimp, worked best. Save some room for the main dishes, which include phad thai talay (tamarind and peanut flavoured flat noodles made from rice flour), and a delicious green curry made from fresh coconut milk, with the perfect balance between the sweet and spicy notes. The pag pahd horapha is also excellent (and not just for vegetarians! ), with dry Thai chilli and palm jaggery giving the stir-fried veggies an extra kick. The desserts are worth sampling. The tub tim grob contains tapioca dusted water chestnuts in rose water-infused coconut milk, while the ngor lychees krati sod is a special innovation by the chef, which sees lychees stuffed with caramalised nuts, soaked in fresh coconut milk.